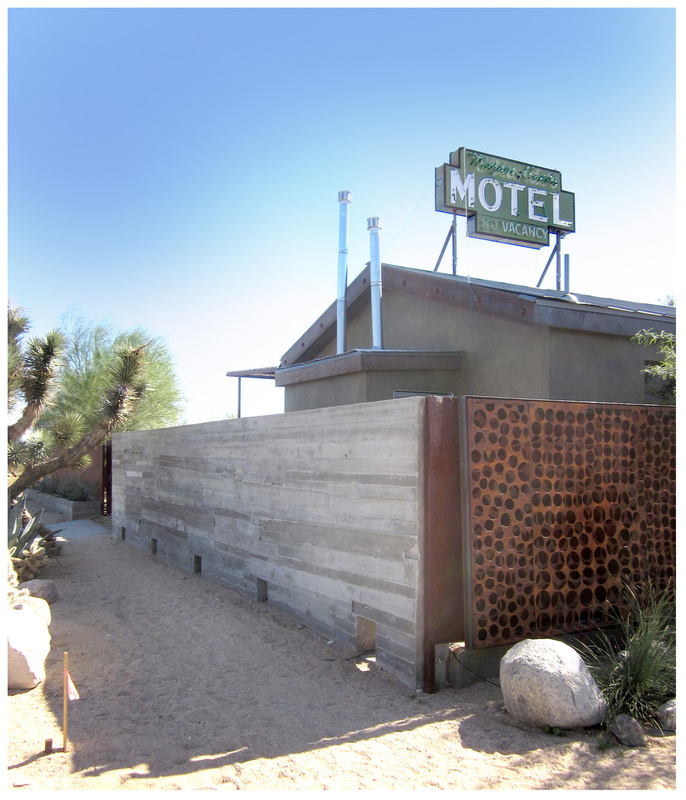 … and as we passed I noticed that the motel seemed to be surrounded — hidden — by a solid metal fence made of rusted steel. Do I have to tell you we stopped to investigate? Parking at an adjoining vacant lot, we got out to have a closer look. 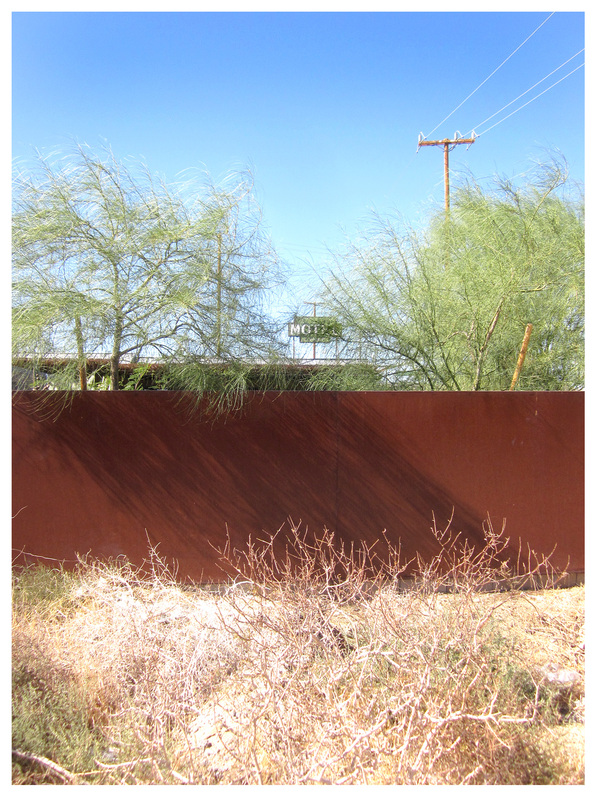 The fence was made of sheets of rusted steel, so finely rusted they almost had a velvety feel. We followed the fence around the perimeter and I couldn’t resist trying to see inside. This attempt to get a peek did not go unnoticed; an SUV pulling in behind the property rolled its window down. The driver asked how I was doing and I told him I was just checking out the awesome rusted fence. He next asked if we’d like to see inside … do I have to tell you we said, “Yes!”? Following the driver inside, we were treated to our first sight of the MOJAVE SANDS MOTEL: a reinvention of a classic ’50s-era desert lodge. On one side, the motel’s 5 rooms are lined up, each with its own small outdoor area fronted by a low stone wall of stacked slate. 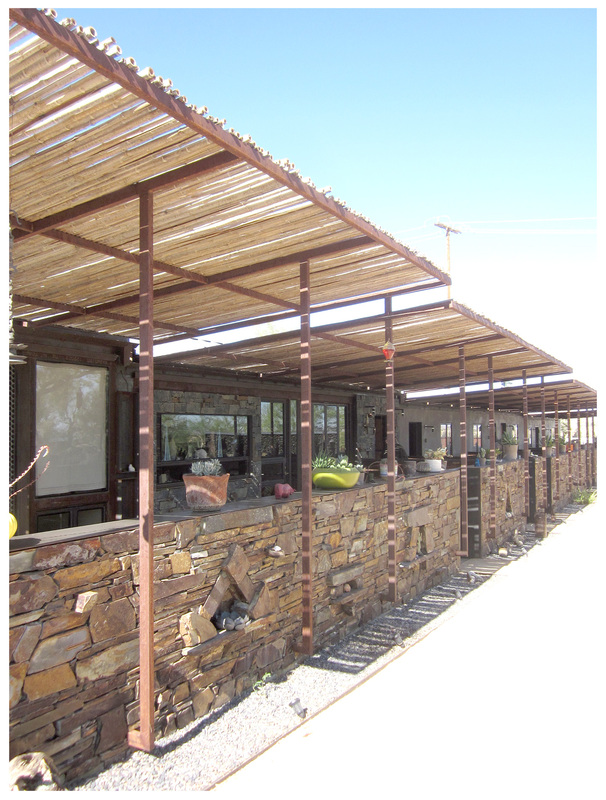 Metal canopies cover the outdoor spaces, with lengths of bamboo providing attractive shade. Owner, Blake Simpson, began the renovation in 2002, doing much of the work himself; on the motel’s website it’s noted that doors, gates, windows and furniture were designed and built on site. This personal attention to detail on Simpson’s part has led to the creation of an extremely well-considered and stylish vision of a desert hideaway. 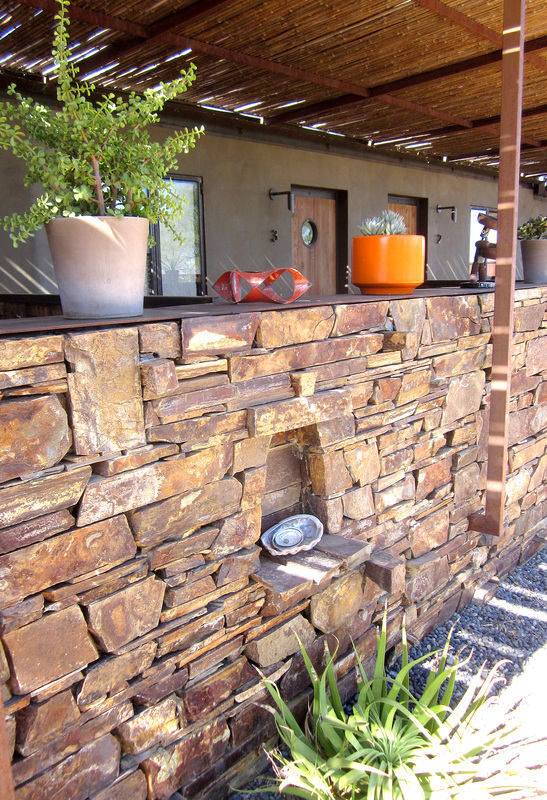 Simpson’s DIY moxie was augmented by talented friends; the gorgeous and period-perfect dry-stacked slate wall was done by a friend who just happened to be around at the right time; others contributed to the interior decorating. 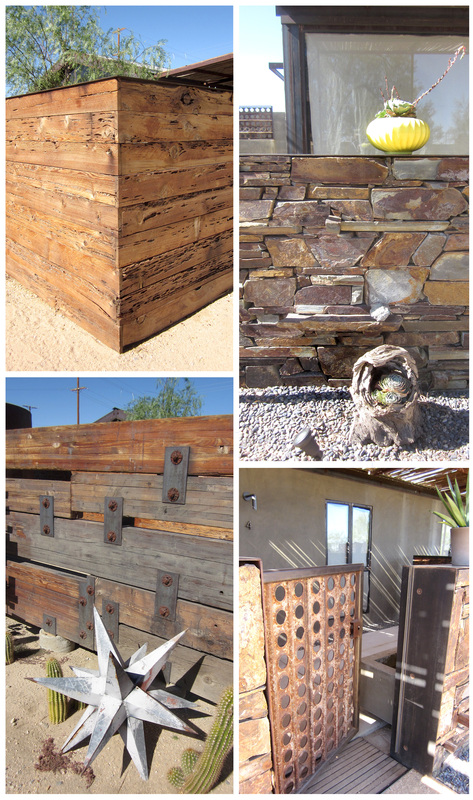 The wall is topped by more sheet metal and serves as a perch for intriguing vintage objéts and succulents … built-in niches provide additional display. Our guide allowed us to view the vacant rooms and I loved their feel of cool, in both literal and figurative senses. Each room featured polished concrete floors, thick, smoothly stuccoed walls and tall beamed ceilings, with low platform beds and bathroom facilities housed inside what looked like steel-framed lanterns. While all fixtures are sleekly modern and understated, some of the accoutrements have a certain vintage wit and include shapely colored art glass, a vintage typewriter (paper, too) and a record player complete with spin-able vinyl. (Not to worry: a refrigerator, coffee maker and grinder and Bose sound-dock are also part of the amenities.) Outdoor spaces feature integrated benches and a small fountain and seating. Outside again, we enjoy the sight of a large reflecting pool backed by a lava rock wall. A floating boardwalk leads over the water to a seating area with curvaceous metal mesh chairs and a mosaic tile topped coffee table. I’d love for our gang of friends to rent the motel for a weekend, but can’t help wondering how many of us would end up taking an impromptu dip negotiating the boardwalk after cocktails … but, doesn’t that sound like fun?! 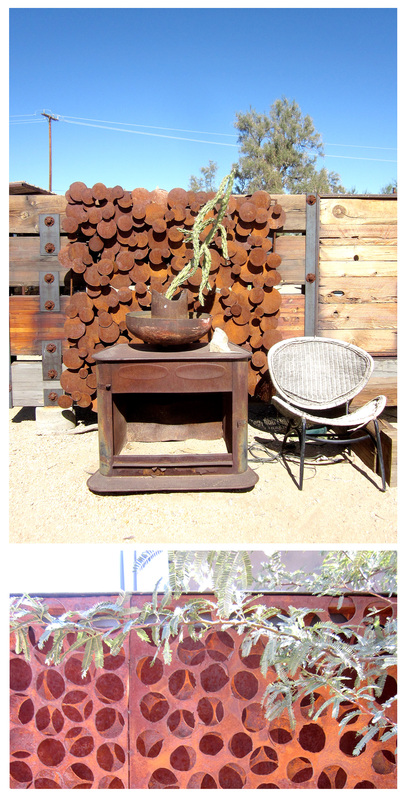 Thrift store, and other vintage finds, pop up in inspired vignettes here and there …. the chance to be tickled visually is all around. 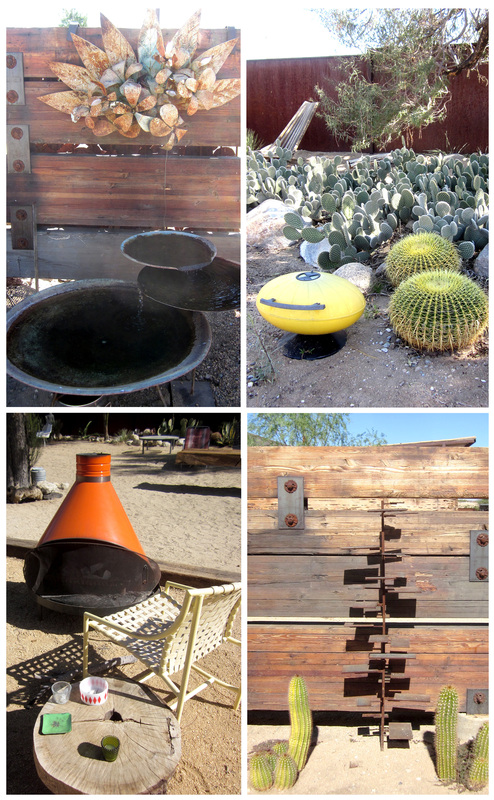 I love the witty juxtaposition of pairing the squatty ’60s yellow bar-b-que with lookalike barrel cactus, as well as the fun irony of metal flowers watering the basins of a found-sculpture fountain. At the rear of the property, our guide points out that a rusted metal sculpture I’m admiring was created using discs cut from the plates at the front rear corner outside the motels fence … talk about coming full circle! We discovered the Mojave Sands because of those circular openings, wondering at the time why they had been made … now, seeing their purpose fulfilled so artfully I was happy that I’d tried to see more … Next challenge: Finding a time when our gang can get together at the Sands! Mojave Sands Motel is located at 62121 29 Palms Highway, Joshua Tree, CA 92252 (cross street is Sunburst); for their website, great additional photos (love the night shots! ), reservation information and phone number, click here. The New York Times’ T Magazine blog has a short post titled ‘Sand Castle’, with excellent pictures of Mojave Sands Motel. Click here to check it out. OK, when can we go?? Spring? Yes … we gotta get cruise director, Jan, on the case! Thanks for another trip! I love all these road trip results. Your pics open such vistas. 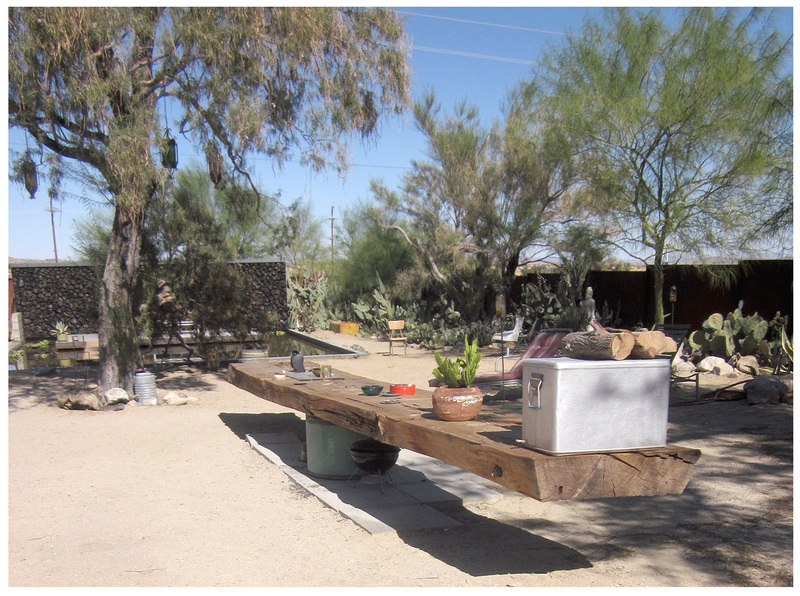 Thanks, Vickie … One more stop on this Joshua Tree day trip to make, and it’s my favorite. Wow, I know where we’ll be staying, should we be so lucky to find ourselves in the area. I can’t wait to stay there, too! Well how cool is that! It looks like you’ve found an artistic soul mate. Really inspirational, and full of ‘why didn’t i think of that? !’ ideas! It does, and its inspired me to make some changes around these parts! Ooh, ooh, ooh…. Want… Now… Srsly. Staying there right now would be great … I love the desert in winter! Lovely article and photos – I love small businesses! I love small businesses too… small, personal, lovingly-created businesses are the best! Oh, can I be part of the gang? That would be so much fun…! What a beautiful place… there is so much I love, I bet your artitistic senses were going crazy!! thanks for the tour of the sands!! Stand by: Next stop is the Purifoy installation. My favorite part of our whole adventure, and, yes, I was blown away completely! I am drooling…. totally captivated! Worth a special trip, without a doubt. Fantastic find!!! Definitely worth a stay … and they’re slated to add a diner next! The kitchen/dining space is almost finished. Should be done within 2-3 weeks. Then the garden, greenhouse, and chicken coop. The 2 vintage trailers are on site & set up for guests as well. Have to get the hot tubs & decks built. Thanks for all the kind words, everybody! …And only going to get nicer!